Our complete guide to how microtransactions work in Apex Legends. Our Apex Legends Apex Coins guide explains how Apex Coins, Legend Tokens and Crafting Metals work, how to get more of them and what cosmetic rewards you can spend them on. Although it's slipped down the Twitch charts a little in recent days, it's still fair to say that Apex Legends is going to be sticking around for the long run, and giving Fortnite something to think about. Although you've got the typical genre standards here - a restricting circle of play, loot everywhere, and a fight to the death - Apex Legends carves out a unique space for itself thanks to its hero system and spread of abilities across that pool of characters. As it's free to play, there are of course some monetisation options as well, and that's where this article comes in. Although you can't buy anything that provides gameplay advantage, you are going to need a few currencies if you want to make your character look a little slicker in battle. Before you go ahead and rocket into battle, we’ve put together a guide which will take you through how microtransactions work in Apex Legends, as well as how to get hold of more Apex Coins which you can use to purchase new cosmetics. There are three different currencies in Apex Legends: Apex Coins, Legend Tokens and Crafting Metals. Apex Coins are the premium currency and can only be purchased with real-world money through the in-game store. Legend Tokens and Crafting Metals can both be earned in-game through the Apex Pack system. Every time you play a match, you earn EXP based on your performance and you’ll gradually level up as you spend more time with the game. Upon levelling up, you’ll receive an Apex Pack which has a chance of containing both of these currencies. 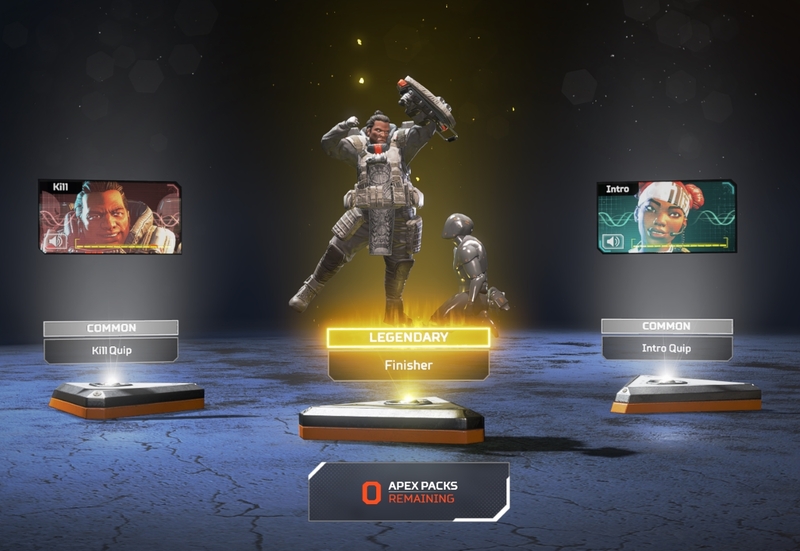 Here's what happens when you crack open an Apex Pack. You'll receive three items of varying rarity, so everything from a new kill intro or skin to some Crafting Metals - nice. What can I buy with Apex Coins, Legend Tokens and Crafting Metals? Here's a breakdown of everything you'll be able to purchase with your materials, coins and the like. Since you've spent your hard earned cash on Apex Coins, you'll be able to purchase anything in the store without having to spend hours grinding for it. However, you won't be able to buy absolutely everything as many smaller Legend related items have to be crafted with Crafting Metals. - Two Legends, Caustic and Mirage cost 12,000 Legend Tokens or 750 Apex Coins each. As time goes by and more updates are released, we'll start seeing more Legends enter the fold. It hasn't been confirmed yet, but we imagine they will cost the same amount. - If you're going for the free to play route, it takes take to build up your Legend Tokens total so don't expect to unlock Caustic and Mirage for a pretty long time. - To build up your Legend Token and Crafting Metals tally as quickly as possible, there's nothing for it but to perform well in each match you play. The longer you survive, the more assists and kills you get will all help bolster the total amount of EXP you earn. In turn, this will grant you faster level ups and more Apex Packs to crack open. Respawn has also published what's in each Apex Pack and your chances of receiving these items. Check it out for an overview of the odds involved. It's worth pointing out that there's an element of "drop protection" to these Apex Packs. You're guaranteed at least one Legendary item drop for every 30 packs opened, and you won't ever receive duplicate cosmetics. This isn't something you get with most Battle Royale games so it's a nice touch.